I spotted this surprise in the Sunday Des Moines Register newspaper. Someone still wants an autograph from the controversial one-time slugger. 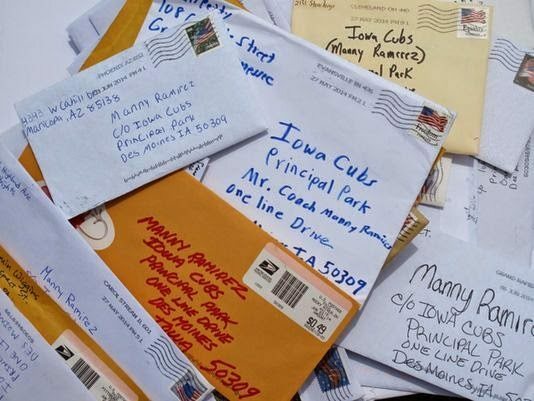 Most of all, I was glad to see that the Iowa Cubs take fan mail seriously. In fact, the “special to the Register” photo credit hints that someone from the I-Cub front office might have provided the picture to the newspaper. I thought an impatient clubhouse man anxious to tidy up could RTS envelopes, simply because ManRam is not there (yet? still???) to claim the mail. By the way, none of the envelopes are mine. How about you?